Hard boil number of eggs required. Skin & wrap 2-3 skinned sausages around egg (the messy part!) to form a ball. Roll the egg with sausage meat wrapped around in beaten egg to coat. Roll in breadcrumbs to coat all around. 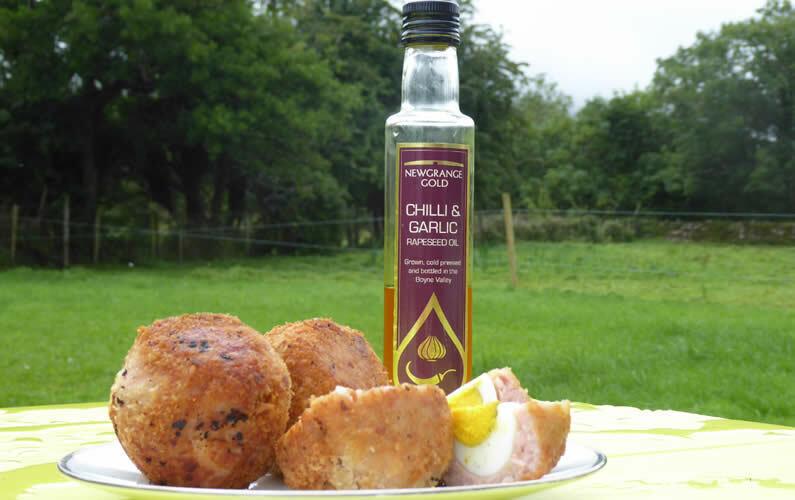 Shallow fry in Newgrange Gold Oil of your preferred taste, slowly turning until golden brown all over. Serve for breakfast, brunch, lunch, lunch boxes, picnics, starters etc! Messy but worth every bit for the delicious taste which you don’t get from shop-bought ones! Let me know what you think! !